Happy Labor day everyone, this weekend I was lucky enough to enjoy some delicious organic fruits and veggies as well as sample some organic wine. I purchased a bottle of 2009 Cono Sur Cabernet Sauvignon, which is produced (certified) organically in Valle de Colchagua, Chile. This has very quickly become my #1 red wine!! Delicious and certified carbon-neutral delivery AND a label made from recycled paper to boot! I can’t complain about my weekend! Getting to enjoy all these organic treats, got me thinking about another one of my faves, chocolate. I will pretty much take chocolate in any form, hot, dark, milk, I have even been known to eat a bag of chocolate chips, straight from the bag. I have never given much thought to where the chocolate came from, how it was grown, harvested or produced. Turns out Nestle, maker of my favorite Kit Kat, as well as Mirage bars and (tear)Häagen-Dazs ice cream gets most or all of their cocoa from West Africa’s Ivory Coast. Didn’t I hear something about the Ivory Coast and child labor? Yep that’s right, now when I look at a delicious Kit Kat bar all I can see is the process of how the chocolate came to be though inhumane conditions and slave labor so that the cocoa can be sold cheap- to Nestle. I wrote to Nestle to urge them to support organic and fair trade cocoa! Click here to do the same. I don’t want to stop eating Kit Kat’s but if no change is made I have no choice. Now my grocery mission is clear this week. Fair Trade chocolate here I come. Read more about more humane chocolate choices @ Big Green Purse. As parents we all know to make sure our plastics are bisphenol A (BPA) free, but most of us have no issues with feeding our kids an apple that’s been rinsed. But really if you sprayed that apple with Raid and then washed it off would you want to feed that to your kids? Not likely but that is pretty much what we’re doing by not feeding our kids organic fruits and veggies..One study stated that by feeding children organic foods they will have 1/6 of the amount of carcinogens in their blood. A $25 million study, funded by the European Union proved that up to 40% more antioxidants could be found in organic fruit and vegetables than in produce grown using pesticides! Check out this website to prioritize what fruits and vegetables we should be replacing first. I stopped in today at Springwillow farms to pick up some organic veggies. YUM. 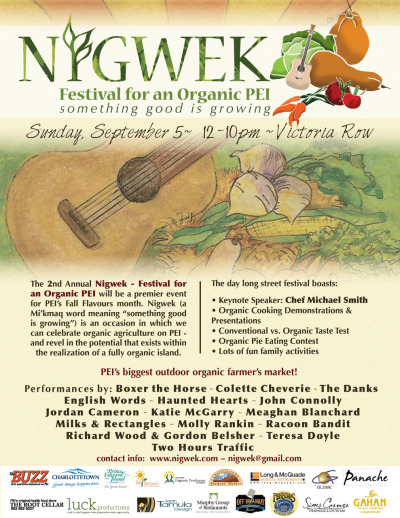 I also came across these great organic farms on P.E.I, Emmerdal Eden Farm in Summerside and Soy Hardy Farm in Alberton. You can also check out this map of P.E.I. which shows all the organic farms! If you want to find an organic farm in a different province http://www.cog.ca/ is the website to visit. Make sure to check out lots of great organic food on Victoria Row this Sunday 12pm-10pm! So today was shopping day. After a tip from a friend I found a bin of Sunlight Green Clean detergent on sale for $2.99 a bottle! The bottle is small so they are on the right track as far as packaging goes. Then I decided to further investigate the “green” and “includes plant based ingredients” claim. There are 6 ingredients that I can’t pronounce and the only natural thing on that list is coconut oil! It is biodegradable in 28 days though? At least it encourages folks to clean with cold water. All in all a step in the right direction but better luck next time for an even greener laundry detergent…maybe Method? They have ingredients that are all safe! If you’re not a huge fan of Tupperware ( mine is plastic #5 which can be recycled curb side in P.E.I.) then another alternative is re-usable sandwich bags. They have tones of them at Etsy. Yet another super cool product is the Goodbyn Lunchbox for kids (I purchased mine from babygrins.ca). Although super cool and eco-friendly this lunch box is a little large and I’m saving mine until A is in grade 2, since this year it doesn’t really fit into his backpack…. Totals for this week/ second week of O.I.M.C.